At Adelante Document Destruction Services, document security is our top priority. From the locked bins we place in your offices to the video-recorded destruction facility, we have the strongest security procedures, throughout the chain of custody, of any shredding business in New Mexico. In fact, we are the only such business in New Mexico to be both NAID AAA Certified and to have attained ISO 9001:2008 from the International Organization of Standardization. We offer both scheduled ongoing bin pickups and one-time purges of records, small to large. Adelante procedures follow the best practice guidelines of the National Association of Information Destruction (NAID) AAA Certification — the highest rating available. When you choose our secure container service, the number of bins you have requested will be delivered to your site. The bins will remain until your scheduled pickup which can be weekly, monthly or on an on-call basis. The containers remain locked at your location, however you can allow a trusted employee to have keys to your bins. Upon scheduled pickup, the locked containers are transported from your locations to our secure facility via a locked, secure box truck. Documents are shredded to 1/2″ strip cut or crosscut, depending on your preference, then baled. Paper bales are transported to a paper mill within the United States for recycling. 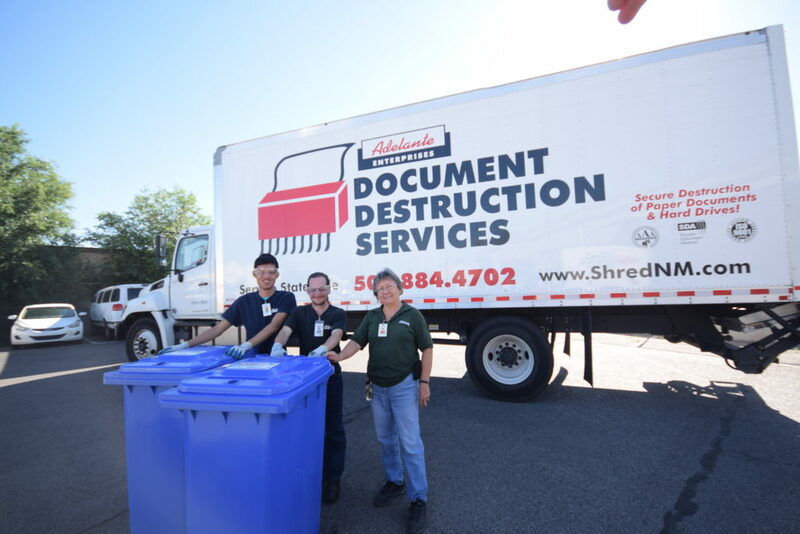 All Adelante document containers are tracked to ensure they are shredded in a timely manner and each bin remains locked within the Secure Document Center until we begin the shredding process. For your further protection, the entire staff at Adelante Document Destruction Services has been through background checks and fingerprinting, and are subject to random drug testing. The staff members are required to wear a uniform and a badge at all times, and only top managers have key access to the facility. All others have to be escorted into the destruction area. Visitors are not encouraged in the facility, however tours are allowed for potential customers. In those instances, each visitor is assigned a temporary security badge and kept out of reading range of any materials.